Figure 1 | A model published by Evans and Stoddart (1) showing that health care was considered by many in 1990 to be the predominant determinant of disease. Reproduced with permission from Elsevier and G. L. Stoddart, 1990. [A text description of this figure is also available.] 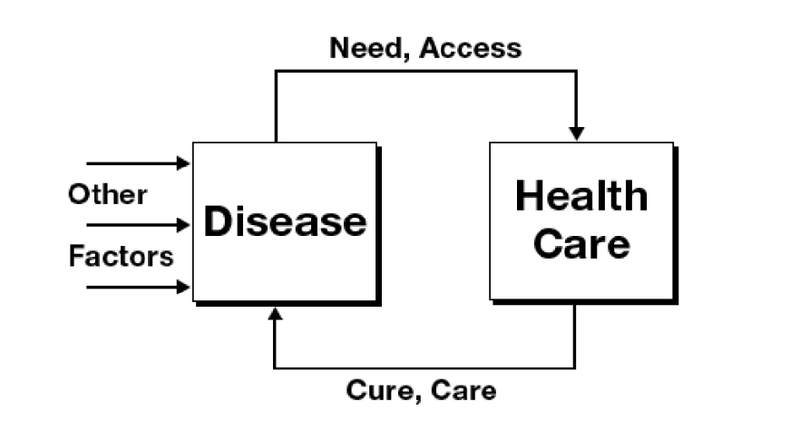 In this simple, essentialy circular model, health care (via cure and care) is the predominant determinant of disease and disease determines. 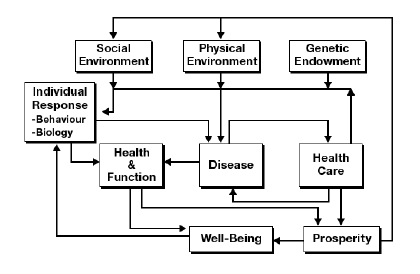 Figure 2 | A model published by Evans and Stoddart (1) that accounted for multiple determinants of disease and health and function and defined well-being as the goal of policy. Reproduced with permission from Elsevier and G. L. Stoddart, 1990. [A text description of this figure is also available.] This complex model shows how the following elements interact with each other to create well-being: the social environment, the physical environment, the genetic environment, individual response (behavior and biology), health and function, disease, health care, and prosperity. In 2003 Evans and Stoddart published a retrospective (8) on “Producing Health, Consuming Health Care.” Although they did find some cause for optimism, their frustration with the lack of interest in promoting the nonclinical determinants of health became clear when they quoted Homer Simpson: “Just because I don’t care doesn’t mean I don’t understand.” The United States does not seem to heed the message that the most significant determinants of health are not health care. Relative to other countries in the Organisation for Economic Cooperation and Development, a consortium of 34 countries dedicated to improving the economic and social well-being of people around the world, the United States continues a practice of overinvesting in health care and underinvesting in the other determinants of health (9). Between 1990 and 2014, health care spending in the United States increased from 12.1% to 17.5% of gross domestic product (GDP) (10). Despite this high level of investment, health outcomes declined relative to other developed countries during the same period (11). national and state health surveys is the percentage of people with fair or poor self-reported health. The association of the word “health” with “health care” is so strong that it creates a conflation of “health care policy” with “health policy” that is impossible to break at times (1, 13). This may be due in part to the size and powerful influence of the health care sector on public policy. We believe that there is a way to mitigate these communication problems. Because “well-being” would simultaneously be a widely endorsed policy goal and a relatively empty space, we suggest that moving the policy discussion from health to well-being might be a way to negate the impact of conflating health care policy with health policy. A focus on well-being might also increase the willingness of policy makers in non-health sectors to join the challenge of improving health by addressing well-being. For individuals, opening the conversation with a discussion of their well-being goals might help them consider how their behaviors and environments contribute to or threaten their sustained well-being. Finally, a focus on well-being might help health policy makers recognize when their decisions will have a negative impact. For example, recognition is growing in Massachusetts that the increasing costs of health care have resulted in reduced spending for education, infrastructure, human services, and other public spending priorities that contribute to well-being (15). In January 2016 the U.S. Department of Health and Human Services announced the Accountable Health Communities Model. This funding opportunity focuses on linking clinical and community-based services that address a range of social needs, including transportation and housing (33). We’ve been wrong about what our job is in medicine. We think our job is to ensure health and survival. But really it is larger than that. It is to enable well-being. And wellbeing is about the reasons one wishes to be alive. Evans, R. G., and G. L. Stoddart. Producing health, consuming health care. Soc Sci Med 1990;31(12):1347–63. http://dx.doi.org/10.1016/0277-9536(90)90074-3 PubMed. Saracci R. The World Health Organisation needs to reconsider its definition of health. BMJ 1997;314(7091):1409–10. http://dx.doi.org/10.1136/bmj.314.7091.1409 PubMed. Forrest CB. A living systems perspective on health. Med Hypotheses 2014;82(2):209–14. http://dx.doi.org/10.1016/j.mehy.2013.11.040 PubMed. Diener E. Guidelines for national indicators of subjective well-being and ill-being. Appl Res Qual Life 2006;1(2):151–7. http://dx.doi.org/10.1007/s11482-006-9007-x. Evans RG, Stoddart GL. Consuming research, producing policy? Am J Public Health 2003;93(3):371–9. http://dx.doi.org/10.2105/AJPH.93.3.371 PubMed. Bradley EH, Elkins BR, Herrin J, Elbel B. Health and social services expenditures: associations with health outcomes. BMJ Qual Saf 2011;20(10):826–31. http://dx.doi.org/10.1136/bmjqs.2010.048363 PubMed. Centers for Medicare & Medicaid Services. National health expenditure data; 2015. https://www.cms.gov/research-statistics-data-and-systems/statistics-trends-andreports/nationalhealthexpenddata/nationalhealthaccountshistorical.html. Accessed March 8, 2016. Baum FE, Bégin M, Houweling TAJ, Taylor S. Changes not for the fainthearted: reorienting health care systems toward health equity through action on the social determinants of health. Am J Public Health 2009;99(11):1967–74. http://dx.doi.org/10.2105/AJPH.2008.154856 PubMed. Diener E, Suh EM, Lucas RE, Smith HL. Subjective well-being: three decades of progress. Psychol Bull 1999;125(2):276–302. http://dx.doi.org/10.1037/0033-2909.125.2.276. Kööts-Ausmees L, Realo A. The association between life satisfaction and self-reported health status in Europe. Eur J Pers 2015;29(6):647–57. http://dx.doi.org/10.1002/per.2037. Keyes CLM. Mental illness and/or mental health? Investigating axioms of the complete state model of health. J Consult Clin Psychol 2005;73(3):539–48. http://dx.doi.org/10.1037/0022-006X.73.3.539 PubMed. Keyes CL, Simoes EJ. To flourish or not: positive mental health and all-cause mortality. Am J Public Health 2012;102(11):2164–72. http://dx.doi.org/10.2105/AJPH.2012.300918 PubMed. Diener E, Oishi S, Lucas RE. National accounts of subjective well-being. Am Psychol 2015;70(3):234–42. http://dx.doi.org/10.1037/a0038899 PubMed. Seligman ME, Steen TA, Park N, Peterson C. Positive psychology progress: empirical validation of interventions. Am Psychol 2005;60(5):410–21. http://dx.doi.org/10.1037/0003-066X.60.5.410 PubMed. Toepfer SM, Cichy K, Peters P. Letters of gratitude: further evidence for author benefits. J Happiness Stud 2012;13(1):187–201. http://dx.doi.org/10.1007/s10902-011-9257-7. Lyubomirsky S, Layous K. How do simple positive activities increase well-being? Curr Dir Psychol Sci 2013;22(1):57–62. http://dx.doi.org/10.1177/0963721412469809. Fowler JH, Christakis NA. Dynamic spread of happiness in a large social network: longitudinal analysis over 20 years in the Framingham Heart Study. BMJ 2008;337:a2338. http://dx.doi.org/10.1136/bmj.a2338 PubMed. Stiglitz JE, Sen A, Fitoussi JP. Report by the Commission on the Measurement of Economic Performance and Social Progress. 2009. http://www.insee.fr/fr/publications-etservices/dossiers_web/stiglitz/doc-commission/RAPPORT_anglais.pdf. Centers for Medicare & Medicaid Services. Accountable health communities model announced; 2016. http://stateofreform.com/news/federal/cms/2016/01/accountablehealth-communities-model-announced. Accessed January 21, 2016. Puska P. Health in all policies — from what to how. Eur J Public Health 2014;24(1):1. http://dx.doi.org/10.1093/eurpub/ckt133 PubMed. Fabius R, Thayer RD, Konicki DL, Yarborough CM, Peterson KW, Isaac F, et al. The link between workforce health and safety and the health of the bottom line: tracking market performance of companies that nurture a “culture of health.” J Occup Environ Med 2013;55(9):993–1000. http://dx.doi.org/10.1097/JOM.0b013e3182a6bb75 PubMed. Fabius R, Loeppke RR, Hohn T, Fabius D, Eisenberg B, Konicki DL, et al. Tracking the market performance of companies that integrate a culture of health and safety: an assessment of corporate health achievement award applicants. J Occup Environ Med 2016;58(1):3–8. http://dx.doi.org/10.1097/JOM.0000000000000638 PubMed. Goetzel RZ, Fabius R, Fabius D, Roemer EC, Thornton N, Kelly RK, et al. The stock performance of C. Everett Koop Award winners compared with the Standard & Poor’s 500 Index. J Occup Environ Med 2016;58(1):9–15. http://dx.doi.org/10.1097/JOM.0000000000000632 PubMed. Grossmeier J, Fabius R, Flynn JP, Noeldner SP, Fabius D, Goetzel RZ, et al. Linking workplace health promotion best practices and organizational financial performance: tracking market performance of companies with highest scores on the HERO scorecard. J Occup Environ Med 2016;58(1):16–23. http://dx.doi.org/10.1097/JOM.0000000000000631 PubMed. Isham GJ, Zimmerman DJ, Kindig DA, Hornseth GW. HealthPartners adopts community business model to deepen focus on nonclinical factors of health outcomes. Health Aff (Millwood) 2013;32(8):1446–52. http://dx.doi.org/10.1377/hlthaff.2011.0567 PubMed. HealthPartners. Children’s health initiative; 2016. https://www.healthpartners.com/hp/about/community-engagement/childrens-healthinitiative. Accessed March 7, 2016. Wilson KS, Kottke TE, Schettle S. Honoring Choices Minnesota: preliminary data from a community-wide advance care planning model. J Am Geriatr Soc 2014;62(12):2420–5. http://dx.doi.org/10.1111/jgs.13136 PubMed. Amherst H. Wilder Foundation. Saint Paul Promise Neighborhood; 2016. https://www.wilder.org/community-leadership/saint-paul-promiseneighborhood/pages/default.aspx. Accessed February 24, 2016. Thomas Kottke is the Medical Director for Well-being at HealthPartners. Matt Stiefel is the senior director of the Population Health at the Kaiser Permanente Care Management Institute. Nicolaas Pronk is the vice president and chief science officer at HealthPartners. The authors are participants in the activities of the Roundtable on Population Health Improvement.